The FIA World Touring Car Championship 2011 season kicks off at Curitiba in Brazil this weekend, marking the start of the evaluation season for Polestar Racing in the championship. Polestar Racing got the green light from Volvo Car Corporation last year to launch a one-car programme for the WTCC 2011 as a commercial and technical evaluation ahead of 2012. "Volvo Cars has given us a sound mission to evaluate the championship, meaning that we are initially not focusing on results but rather on preparing a base that we could build upon for 2012. We have got an exciting and rewarding challenge ahead of us," said Christian Dahl, Managing Director of Polestar Racing. The Polestar Racing prepared Volvo C30 DRIVe is a proven winner with multiple titles and race victories in the Swedish and Scandinavian Touring Car Championships. But a lot of development work is needed for the new WTCC tracks, as well as the new engine regulations. "We are starting the season with our current two litre engine, before later in the year switching to an all-new 1.6 turbo engine, based on a completely new Volvo engine family. We are currently working flat out with the new engine and we are confident of our progress," said Dahl. Robert Dahlgren is going to be on the grid with the 2011 specification Volvo C30 DRIVe and he is keen to get going. "I am very much looking forward to the season start. The first race of the year is by no means going to be easy, especially with the high level of competition and the fact that we are new to the championship. But we have got a solid programme and we are ready," said Dahlgren. The first race of the year is also going to showcase a new livery of the Volvo C30 DRIVe racing car. 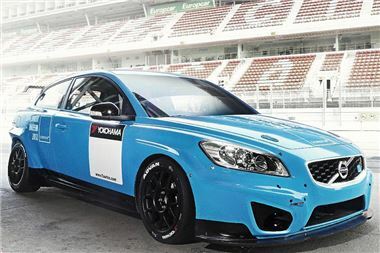 The car is painted in the distinctive Polestar-blue, also featured on the Volvo C30 Polestar concept prototype car. Follow the efforts of Polestar Racing in the FIA World Touring Car Championship 2011 at www.volvopolestarracing.com for the latest news, results and more.